Your Cat Ate Onion -- Now What? Home / Your Cat Ate Onion — Now What? 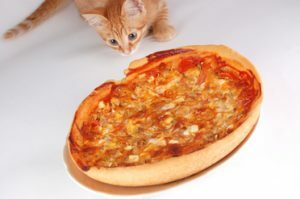 Do you have a pizza-loving cat or a cat who likes nothing more than lapping up the gravy from your leftover pot roast? Some “people food” is good for cats. Just make sure it doesn’t contain onion. Did you know that cats and onions are a deadly combination? If you think your cat ate onion, it’s time to contact the vet! Even a tiny amount of onion or onion powder can be fatal. Ingesting just five grams of onion can make a cat sick, according to the veterinarians at VPI (now Nationwide) Pet Insurance. In “A Guide to Poisonous House and Garden Plants,” veterinarian AP Knight, a Diplomat of the American College of Veterinary Internal Medicine, says cats have been poisoned after eating baby food that contains just 0.3 percent onion powder. The cat’s breath may smell like onions. Symptoms can appear from one to several days later, depending on how much onion the cat ate. If you think your cat ate onion, he should see a veterinarian immediately. Knight says inducing vomiting can be an effective treatment if the cat has eaten onion within the last two hours. If no veterinarian is available, you can induce vomiting by giving one teaspoon or five cc of three percent hydrogen peroxide (not the hair coloring strength) per ten pounds of body weight. Once given, veterinarian Dawn Rubin suggests walking the cat around or gently shaking its stomach to mix the peroxide with the contents of the stomach. If the cat doesn’t vomit within 20 minutes, repeat the treatment, but repeat it just once. After the cat has vomited, giving him activated charcoal will prevent absorption of any remaining onion. Onion toxicity can be fatal. If your cat ate onion, prompt action can save his life!